What in the world were the Tennessee Volunteers thinking? Whatever it was, the power of the people proved to be enormous and led to a crazy college football story that embarrassed Tennessee and brought the Jerry Sandusky scandal back into the limelight Sunday. The silly season of postseason coaching moves kicked off with some big news and names, and for some bizarre reason, Tennessee decided to hire Ohio State defensive coordinator Greg Schiano as its new football coach. Which lasted about six hours. Even if just for football reasons, going with Schiano made little sense for the Vols. He had some success at Rutgers but is known as a prickly guy who has shown a penchant for alienating many people around him — players, team officials and fans alike — which made him a terrible fit for a proud Tennessee program that has fallen on hard times and needs someone personable who can win back fans and sell the program. It didn’t take long after news broke of the hiring for many people to point out that Schiano was linked to the Sandusky scandal from his time as a Penn State assistant coach (1990-95). Once word of that spread, the power of social media doomed Schiano and made it impossible for Tennessee to move forward with the hire. Former Penn State assistant coach Mike McQueary testified during a deposition in 2015 that he was made aware that Schiano had witnessed Sandusky abuse a child in the 1990s. McQueary testified that former PSU assistant Tom Bradley had told him a story concerning Schiano. McQueary then was asked if Bradley named the assistant and answered that it was Schiano. “I can’t remember if it was one night or one morning, but that Greg had come into (Bradley’s) office white as a ghost and said he just saw Jerry doing something to a boy in the shower. And that’s it. That’s all he ever told me,” McQueary testified. Schiano and Bradley both have denied McQueary’s testimony. As criticism from all corners mounted, it became clear as Sunday went on that there was no way Schiano could be the Vols’ football coach. ESPN then confirmed around 9 p.m. that Tennessee had reversed course and backed out of hiring him. We don’t know what Schiano does or does not know about the Sandusky situation. But McQueary’s testimony is on the record. That makes Schiano tainted goods, and any school that wants to hire him as a head coach would do so with full understanding that he would have to answer to that very uncomfortable past. Given what happened Sunday, it’s hard to believe any major college program would give Schiano a chance to be head coach. He was head coach of the Tampa Bay Buccaneers in the NFL from 2012-13, and since that was a disaster and he got fired, it’s doubtful he’ll land another NFL head coaching job again either. n I’m sure Pitt fans are all torn up about Todd Graham getting fired at Arizona State. Their nickname for him of Fraud Graham is hilarious. n Don’t be surprised if Joe Moorhead’s name comes up in connection with at least one head coaching job somewhere. Now, whether any of those jobs would be good enough to entice Moorhead to leave PSU is another story. And he might not be ready to make such a move just yet anyway. 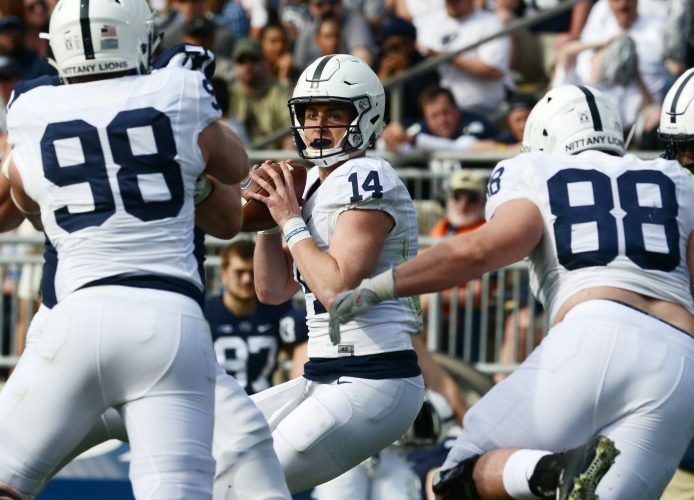 However, keep this in mind: Moorhead is a hot commodity after a strong offensive season by the Lions, but they lose Saquon Barkley, Mike Gesicki and DaeSean Hamilton next year, so it will be tougher to put up such big numbers. Moorhead surely knows that if the offense struggles a bit next season, some of the luster might come off him. n James Franklin’s name probably will surface in the Texas A&M job search. No way he’s going there. Penn State is a better job, first of all. And Kevin Sumlin’s wife complained in September about her husband receiving racist threats. Franklin won’t want any part of that mess.